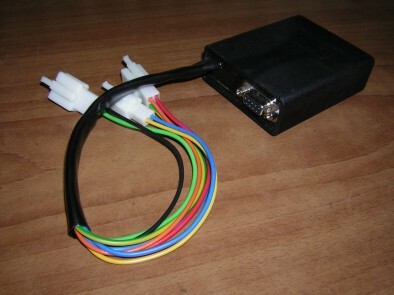 Programmable capacitive ignition for motorbikes supplied by 12 V.
SPARKER DCCDIP ignition is a programmable capacitive device with electronic regulation of ignition advance as function of rpm (engine speed). CDI ignition supplied by HV alternator coil is used with most of the single-cylinder road motorbikes. However this coil is often damaged and repairs do not lead to desirable effects. That is why we offer SPARKER DC-CDI-P ignition for bikes equipped with an accumulator. SPARKER DCCDIP ignition is made in many versions for individual bike types. Ignition is designed for rampant CKPS system. It can be assembled to practically any carburettor single-cylinder motorbike with stable dashboard voltage 12 V. DR, XL, KLR, XT, most of two-stroke engines ... motorbikes can be mentioned as an example. SPARKER DCCDIP ignition is equipped with a two switching inputs. Function of this inputs is selectable. E.g BLOCKING for sidestand switch or ENGINE OFF switch, racing funcion e.g. CLUTCH MASTER, START LIMITER and CURVE B. Ignition is equipped with a outputs for tachometer and GEAR SHIFT LIGHT. The ignition unit is sealed in a plastic box 85x67x26 mm with bundles of input and output conductors with pins. Counterpart connectors are supplied. We provide expert installation of the device in our specialized shop. For those interested in assembly procedure detailed assembly manuals are available here..